A look back at Akamai's big news and major moves. The iPhone 5 launch on Wednesday, Sept. 12 is sure to be the most important event for tech investors this year. The Motley Fool will be hosting a live chat where our top tech analysts will answer your questions and break down what the announcement means for Apple and tech investors everywhere. Be sure to swing by Fool.com at 12:45 p.m. EDT this Wednesday for all your coverage of Apple's next big announcement. Shares of Akamai (Nasdaq: AKAM) hit a 52-week high last week. Let's look at what's driving these gains to understand what lies over the horizon. Are there clear skies ahead? AKAM Total Return Price data by YCharts. Limelight was flying as high as Akamai early this year after reporting strong earnings of its own. Since then, it's been a long way down for Limelight, spurred by a disappointing second quarter and a court ruling against it in an Akamai-initiated patent suit. Level 3's second quarter was perhaps the worst of the trio, with European weakness contributing to wider-than-expected losses. All three companies face the eventual defection of a major customer -- Netflix (Nasdaq: NFLX) launched its own in-house content-delivery network this summer, with the goal of serving most of its Internet-hogging data directly. That may be a long-term benefit, as helping Netflix stream millions movies is a low-margin line of business with high demands for additional hardware. 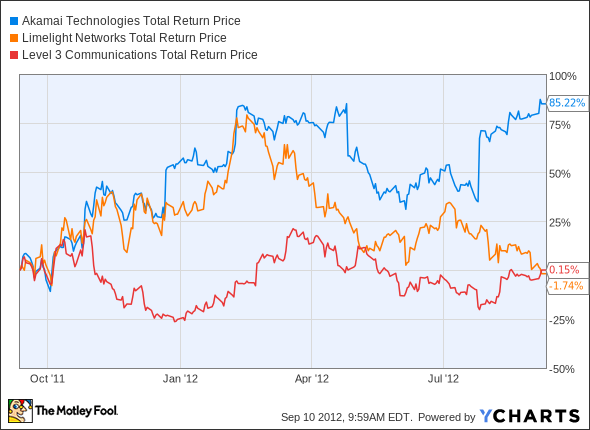 We've taken a look at what pushed Akamai above its peers, so now let's dig deeper. Source: Yahoo! Finance. TTM = trailing 12 months. NM = not meaningful due to negative results. Akamai's not exactly cheap on either a P/E or a price-to-free-cash-flow basis, especially considering the somewhat underwhelming forward growth analysts have estimated. Although losing Netflix may actually improve margins, Akamai might also have to worry about search giant Google (Nasdaq: GOOG) reducing its cooperation with Contendo, which Akamai acquired last December. 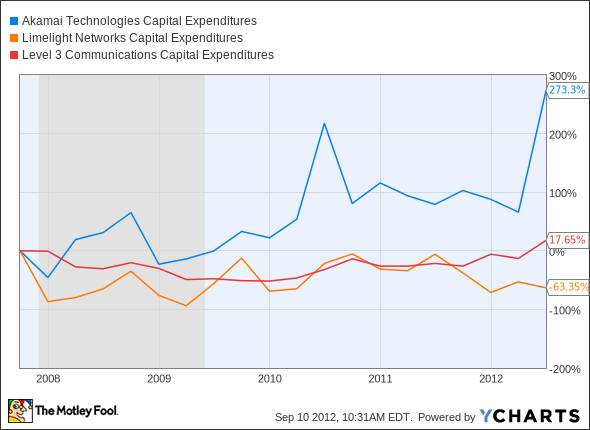 AKAM Capital Expenditures data by YCharts. 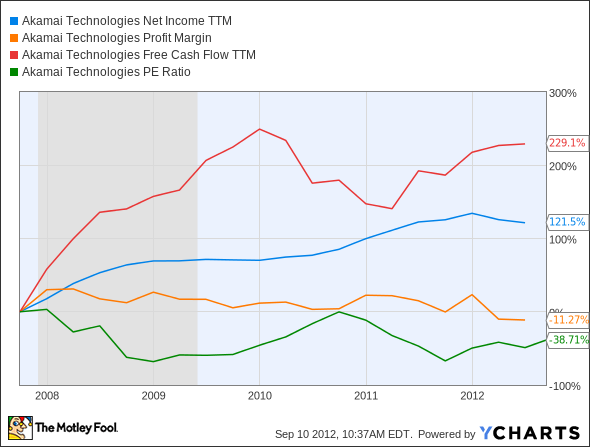 AKAM Net Income TTM data by YCharts. There is a risk that the company's P/E might shrink again without the bottom line growing enough to sustain further stock-price growth, as it's moved closer to the upper than the lower boundary of its five-year range. However, as long as Akamai maintains its leading position in the content-delivery game, the sum of these changes should remain positive for shareholders. If you want to keep a close eye on Netflix as it transitions from Akamai's friend to its frenemy, then the Fool's new premium research service has what you need. Subscribers gain access to a full year of detailed updates from our top tech analysts, so you can stay on top of Netflix's content-delivery drama and make the right investment choices with confidence. Sign up for your subscription today.